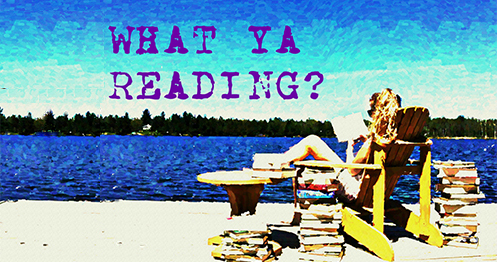 Review and Giveaway of Wrecked by Elle Casey | What YA Reading? If you liked The Breakfast Club and The Swiss Family Robinson, you’ll love WRECKED! An ill-fated Caribbean cruise and four teenagers: a nerd, a jock, a mouse, and a beauty queen…an island, a treehouse, some nefarious interlopers…life and death…fear and loathing…love and laughter. Follow Jonathan, Kevin, Candi and Sarah as they find their typical high school lives and their worlds totally WRECKED. Although it has been described differently, I think that Wrecked is more Swiss Family Robinson meets Barbie as the Island Princess than anything else. From the tree house-building to the convenient discovery of edible goodies to the Island Prom Night, I wouldn’t have been surprised if the group found a pet elephant and christened him Rocky. Quite frankly, I wouldn’t have been surprised if that pet elephant grew freakishly long eyelashes and Sarah sang him lullabies derived from the Gwen Stefani song about bananas– if only to annoy the rest of the island’s residents. What is that song called, anyway? Hollaback Girl? Notwithstanding, I have decided that I couldn’t care less that Wrecked is so predictable. I may even have enjoyed it so much because of its predictability; it’s the summertime, I’m excited to be done with the ungodly depth of my school work– I could use a little bit of an escape. And if that escape means clichés, then I’m all for them. What you may not understand is that when I say clichés, I mean serious clichés. In Wrecked, the literal only girls in the world suddenly become dating material on the island’s beautiful beach. Bananas and coconuts just happen to be available for scavenging. Pirates play a crucial role to the plot. Miss Casey’s characters rapidly become apt in convenient domains, such as spear-fishing, dreadlocks-creating, and bamboo-wielding. However, as much as Wrecked supports the existence of clichés, it defies that of stereotypes. Ironically, it does so through their use: Sarah Peterson is her high school’s most prominent socialite; her twin brother, Kevin, is a popular jock who abuses of his good looks; Jonathan Buckley is an insanely intelligent nerd lacking most forms of social grace; Candi, his sister, is a completely average high school girl sporting a crush on a completely unaverage person. Throw in an imposed cruise–courtesy of the Peterson’s–, some bad attitude–courtesy of Sarah– and a dash of untimely bad weather, and I believe we have a recipe for disaster, my friends. The problem is that when Sarah, Kevin, Jonathan, and Candi find themselves on a deserted island in the middle of the Atlantic, they realize that this so-called disaster may not be so disastrous, after all. Especially when they begin to see behind the unforgiviving molds of their high school stereotypes. Yes, Wrecked‘s premise is priceless. I love the idea that when four teenagers are forced to spend months together, united in the battle for survival, they will ultimately ditch their ﻿﻿﻿﻿﻿﻿﻿﻿﻿conforming stereotypes in the favour of friendship. The character development here is invaluable, as is this life lesson presented to readers in a light, fluffy package. Something else for which I would love to commend Elle is her bravery when it comes to her blatant acknowledgement of human bodily functions. If I had a dime for every time I read a high action, spy-type novel and wondered how the protagonist went for so freaking long without peeing, I would be in a Jacuzzi right now. I mean, if I ever had to case an art museum for a period of at least four hours straight (or, in this case, ride in a flimsy lifeboat across the Atlantic Ocean for a few days), I would need a washroom break. I’m just saying. The one part of Wrecked with which I cannot come to terms is its ending. After finishing the last chapter, the only emotion I felt was shock. I could not believe that the novel just ended with Sarah in her *ahem* condition and Kevin in his *ahem* assholic attempts to win back his girl. I still cannot believe that the novel just ended like this. There is a fine line between cliffhangers and unsatisfying endings; Elle Casey has not only crossed this line, but repeatedly run over it with her car in the vain hope that her readers would be too confused by the wreckage to notice the fact that the novel didn’t even end. All I can do at this point is hope for a sequel. Please, Elle. Please. I’m giving Wrecked 3.5/5 stars. It was a light, fun, and summery read. I don’t feel any terrible attachment to it, but this is not the type of book that’s expected to hit you on an emotional level. It’s predictable and it’s cliché, but it’s one helluva of an entertaining read. So, go read it. Or go win it. Whichever works. Having trouble entering this giveaway? It’s actually pretty simple. Click the ‘Log in with Facebook’ box and enter your email address and Facebook password. Hit the Log in button. Or, if you prefer to just use your email address, click on the ‘Use your email’ box. Enter your name and email address. Hit the Log in button. And voilà!